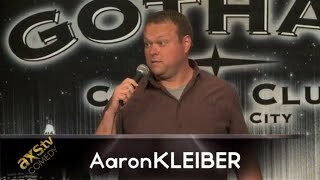 On the strength of his energized, crowd-pleasing live performances, Aaron Kleiber has emerged as one of the most in-demand feature acts in stand-up - touring alongside Bob Saget, Jim Breuer, Bert Kreischer, Harland Williams - and now breaking out as a headliner himself. Kleiber made his nationally-televised stand-up debut on 'Gotham Comedy Live' in 2013 and shortly thereafter made his second on 'Standup and Deliver.' Aaron was just announced as part of the 2014 LimeStone Comedy Festival lineup in Bloomington, Indiana. He’s been seen in a recurring role on the Nickelodeon series 'Supah Ninjas,' as well as “Mercury Men” for SyFy. His film roles include a co-starring role in 'Help Me, Help You' opposite Sabrina Bryan and an appearance in the acclaimed Lionsgate drama 'Warrior' - along with the award-winning indie hits, 'A Great Disturbance' and 'Captain Blasto.' A native of Pittsburgh, PA - Kleiber was named 'Best Local Comedian' in 2012 and 2013 by Pittsburgh Magazine.